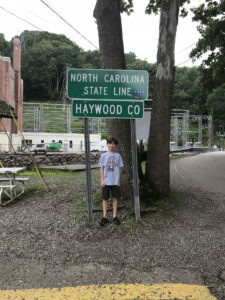 I HAVE WANTED to go to the Carolinas for over 30 years. 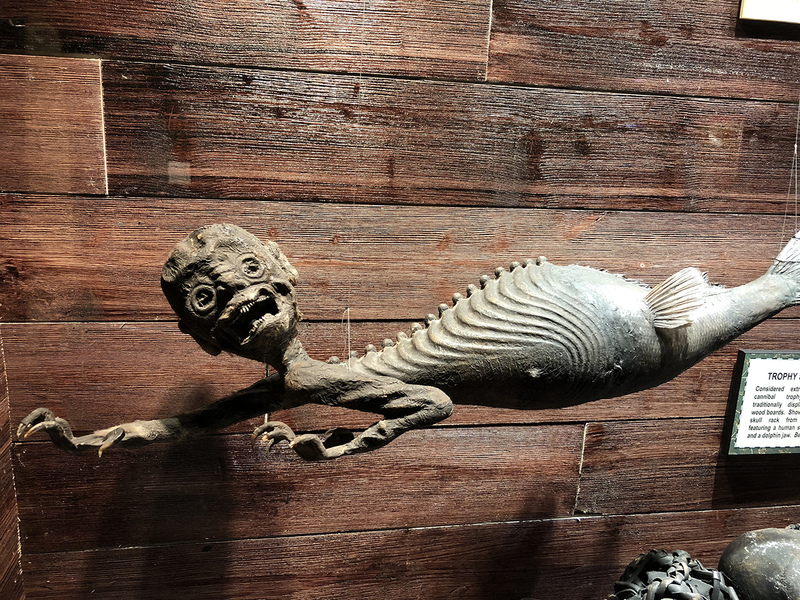 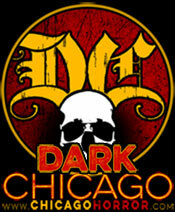 My wife Geri and I have talked about going for most of that time. 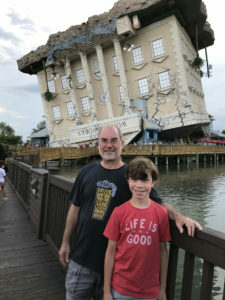 George, one of my best friends in college, had planned to drive there with me over our winter break during my junior or senior year while we were at University of Illinois… but then a massive ice storm hit the east coast that Christmas, and so we had to cancel. 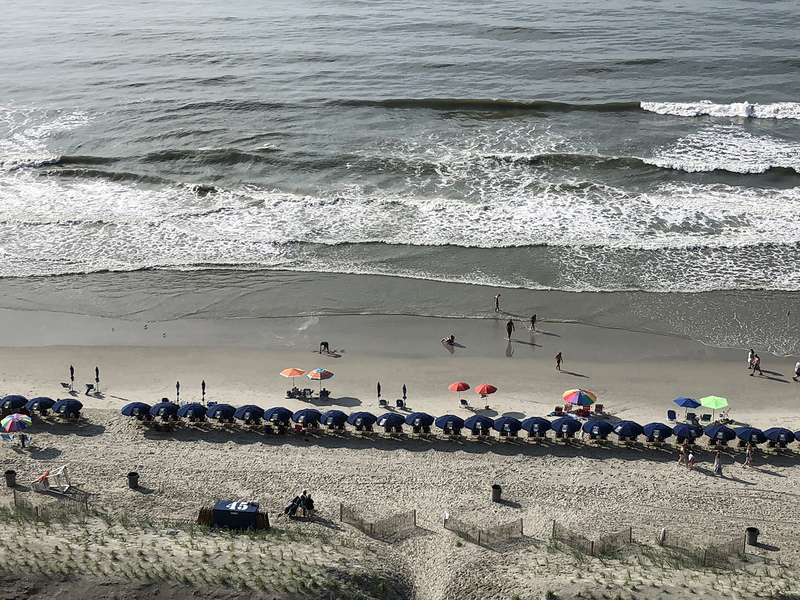 I’ve traveled to all sorts of places over the past couple decades for my dayjob… but though I’ve literally visited dozens of cities for work, they were never anywhere in North or South Carolina. 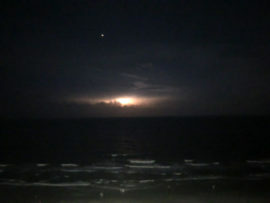 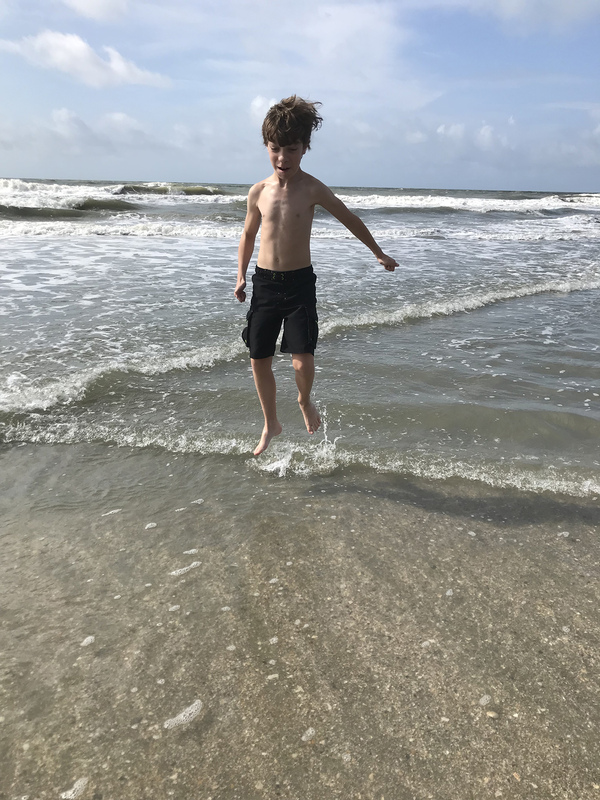 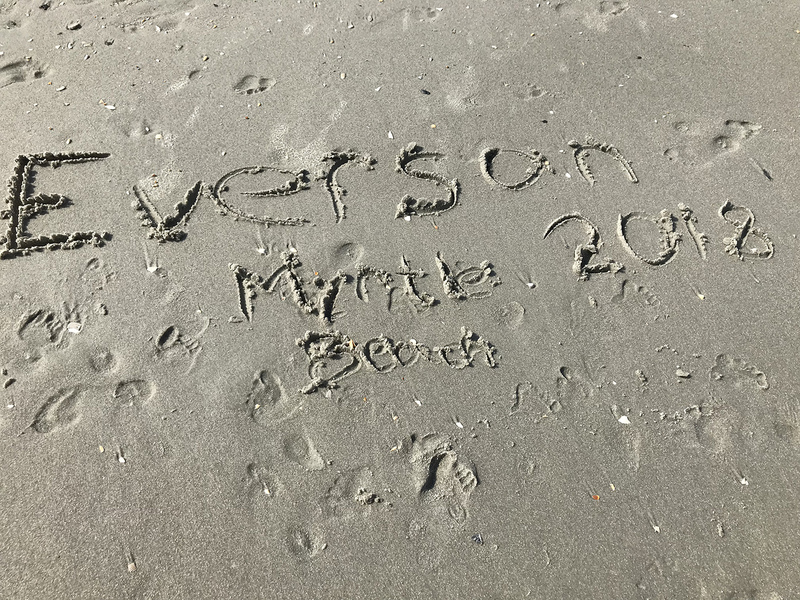 It took until this past week for me to finally get in the car and go… to Myrtle Beach. 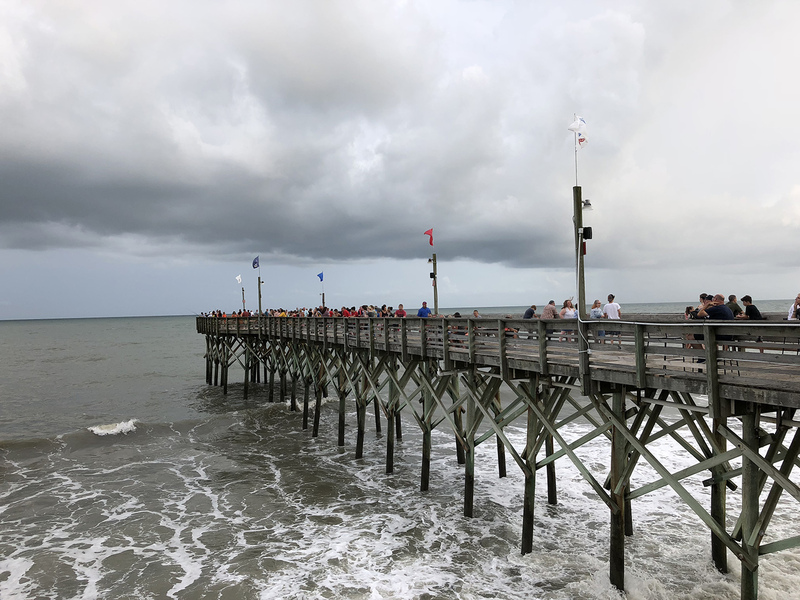 After not going far from home last summer, this year Geri and Shaun and I decided to stage a driving vacation to South Carolina, and so we packed up the car last Friday night, and headed out early Saturday morning for the long drive to the coast. 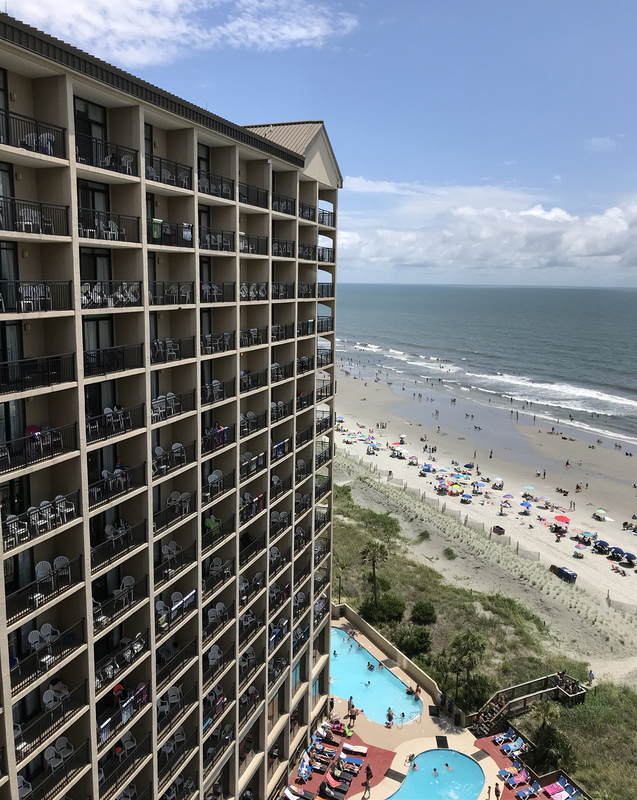 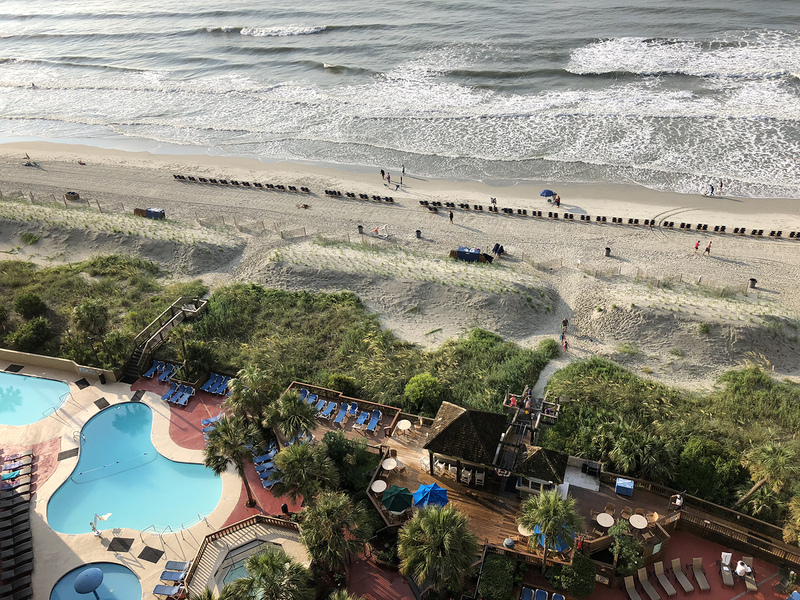 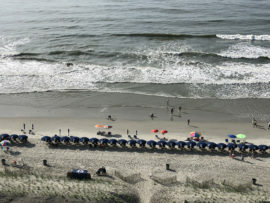 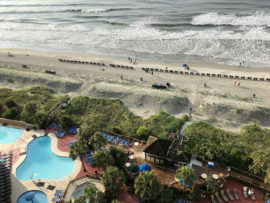 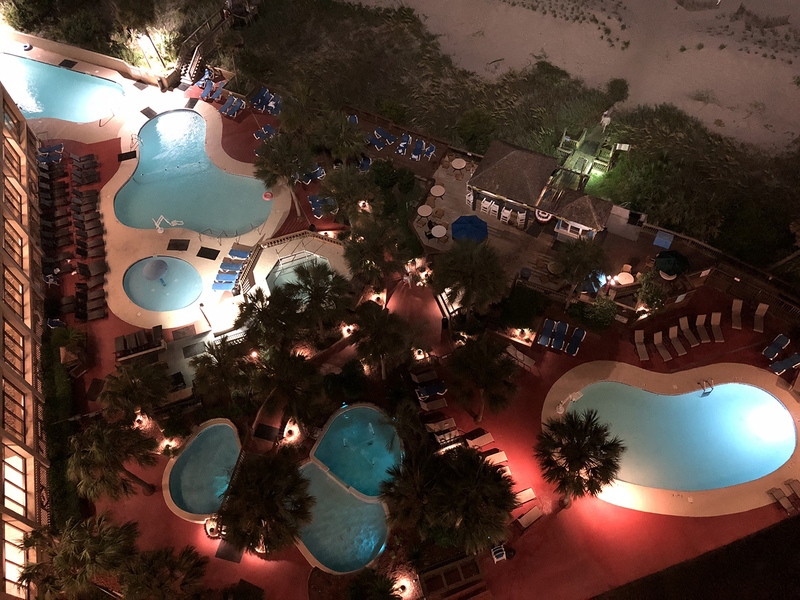 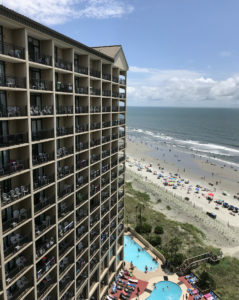 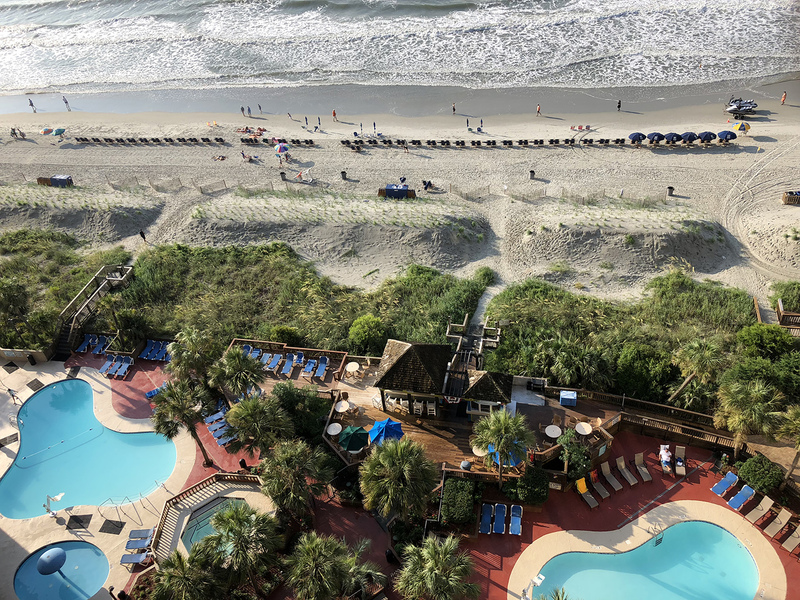 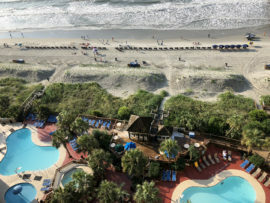 We booked a condo on North Myrtle Beach for four nights. 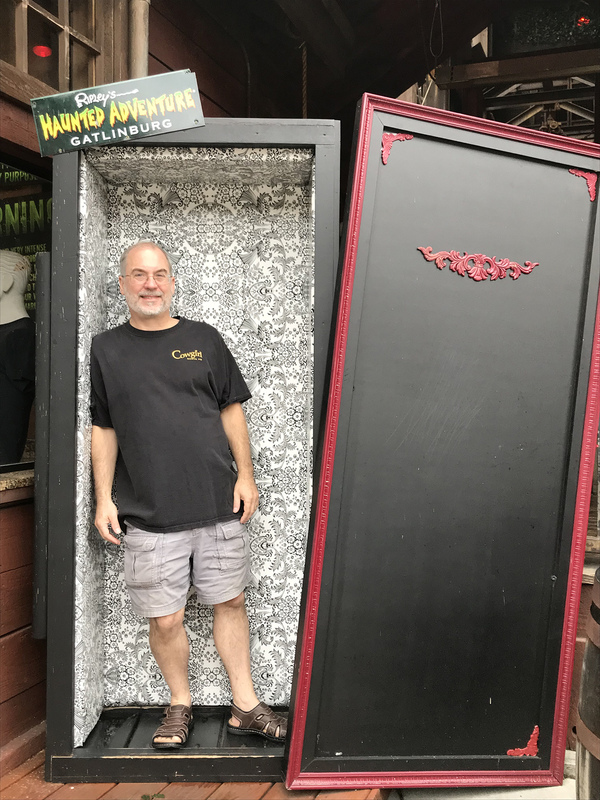 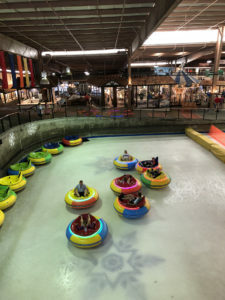 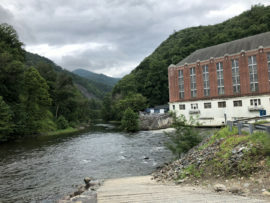 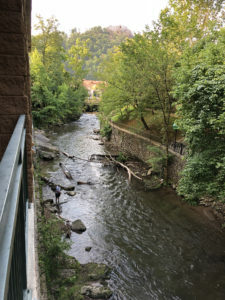 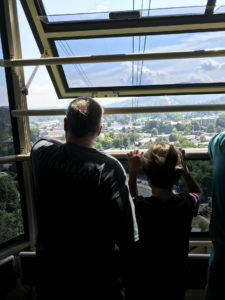 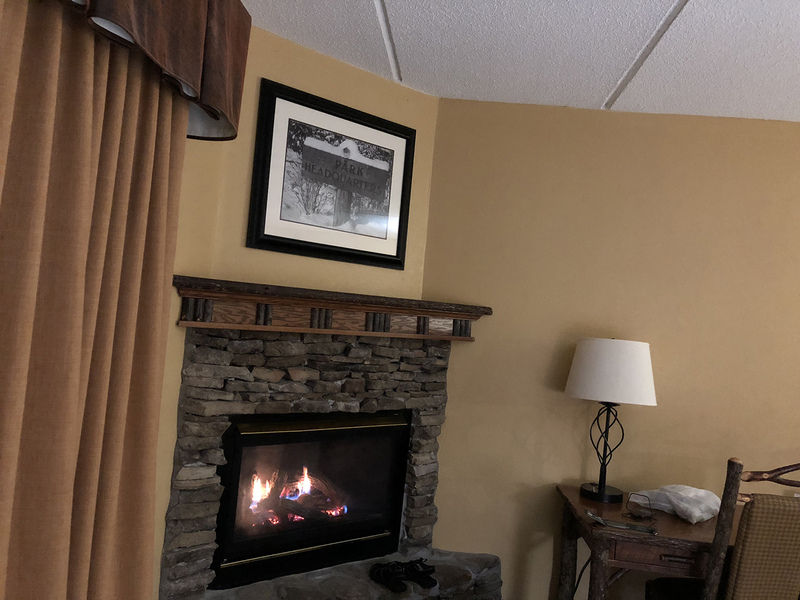 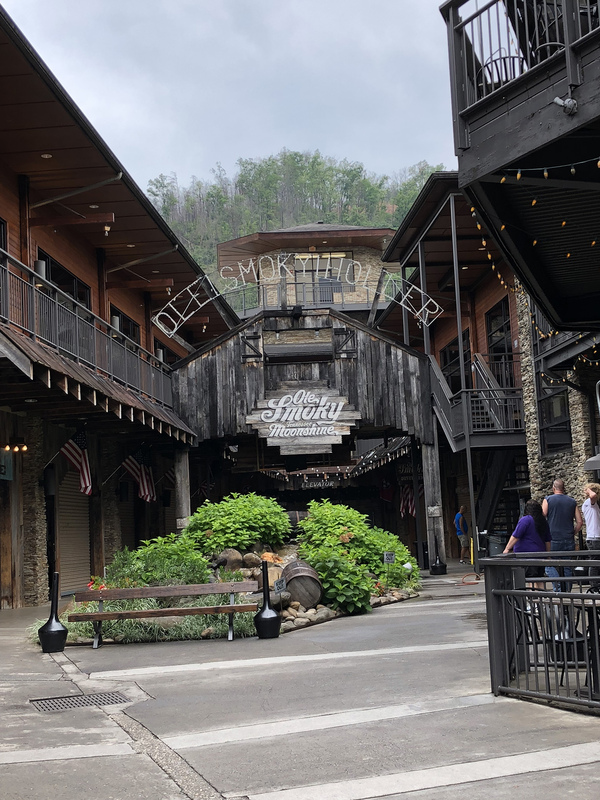 But since it’s almost a 16-hour drive there from Chicago, we also booked a hotel room in between for a Saturday night stay in Gatlinburg, Tennessee, another place I’ve always been interested in as it’s considered the “gateway” to the Smoky Mountains. 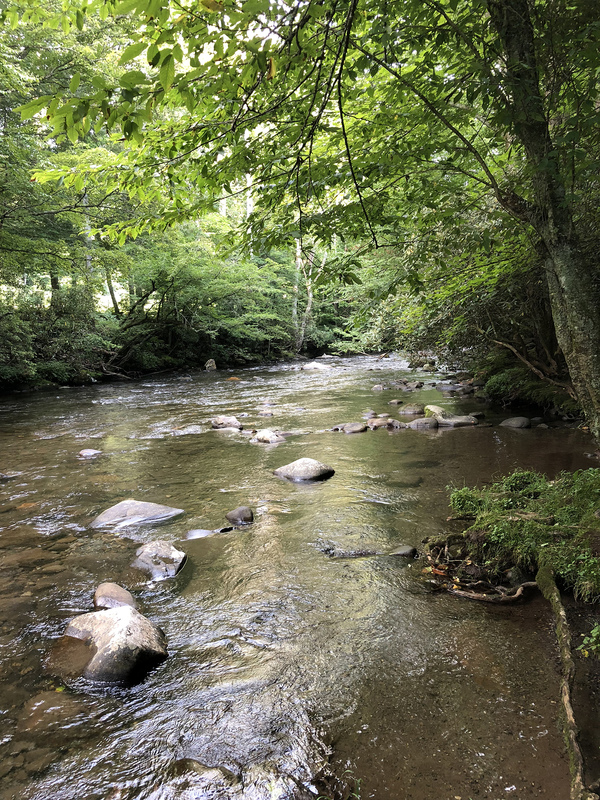 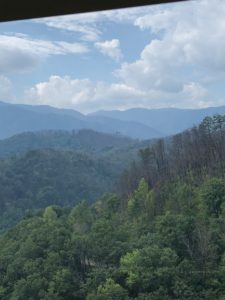 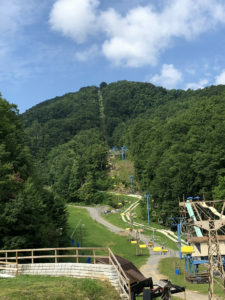 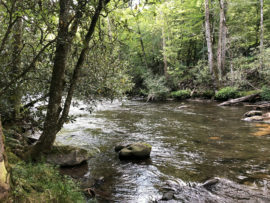 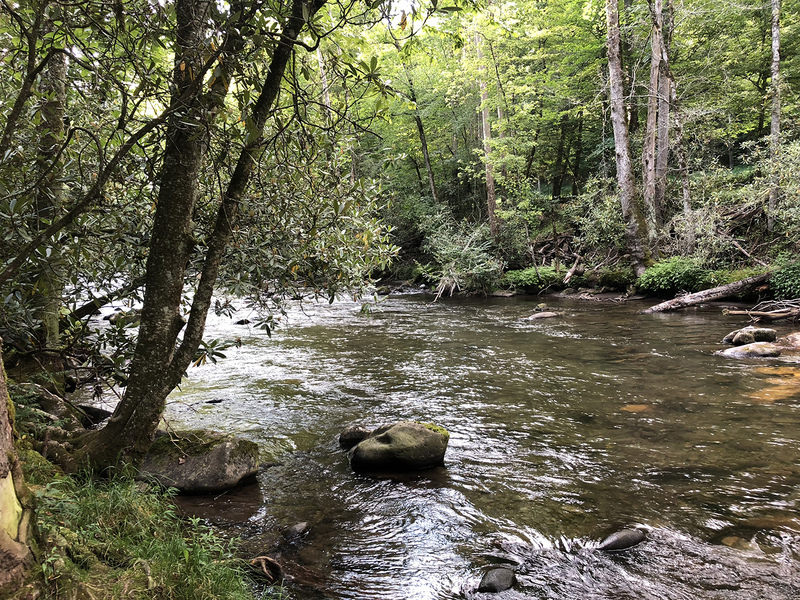 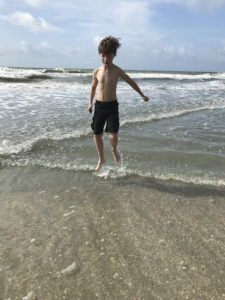 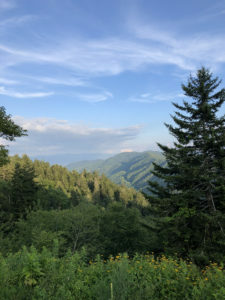 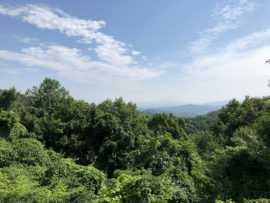 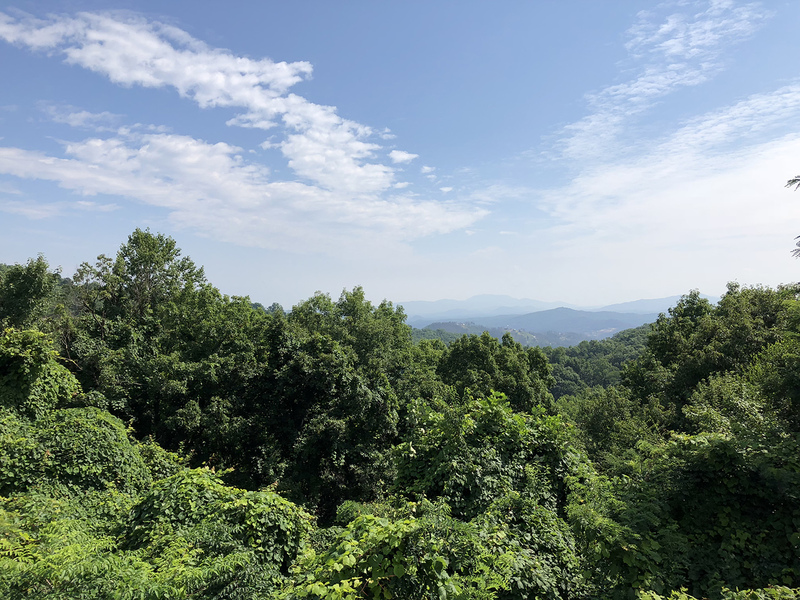 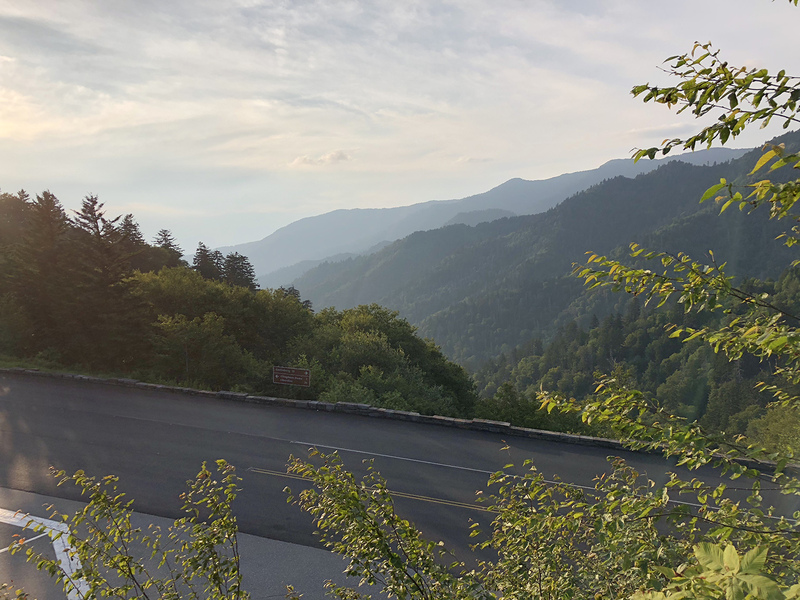 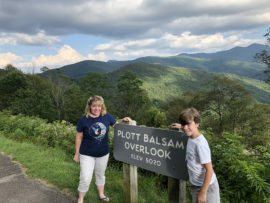 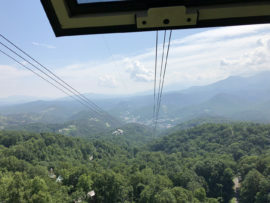 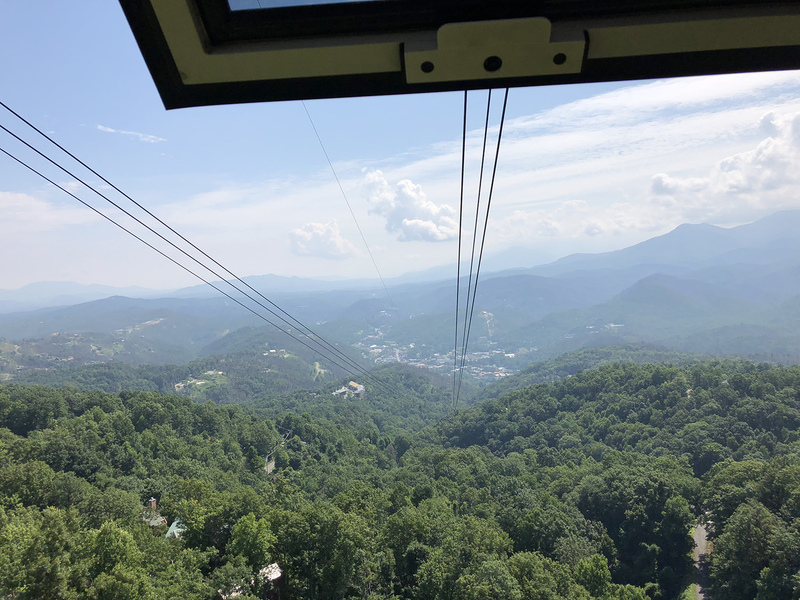 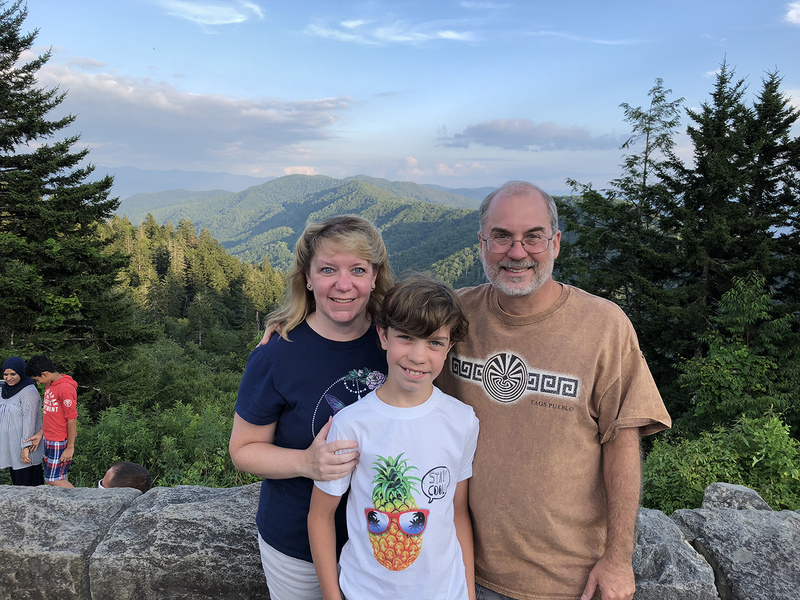 As it turned out, while I enjoyed Myrtle Beach (I am always a sucker for the ocean), I think I may have enjoyed our brief sojourn in the Smoky Mountains on the way to and from the beach even more! 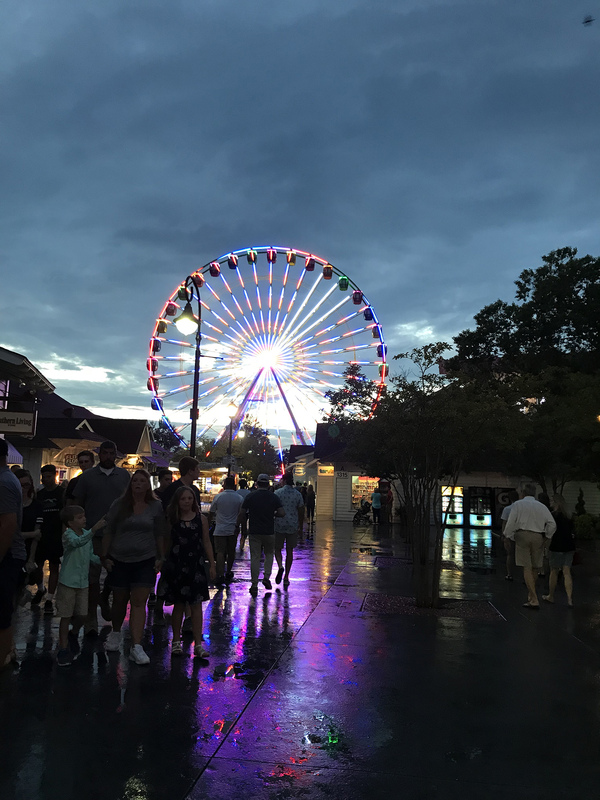 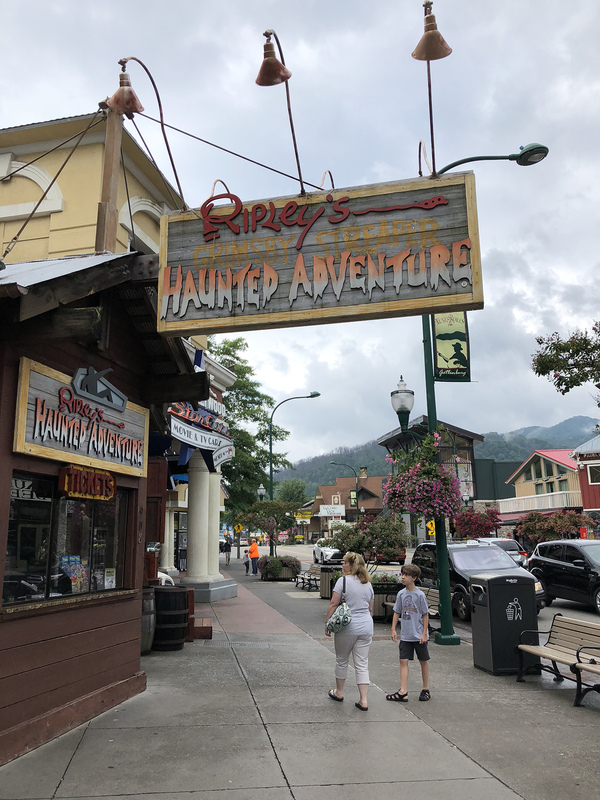 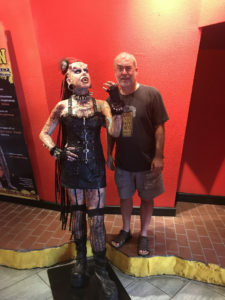 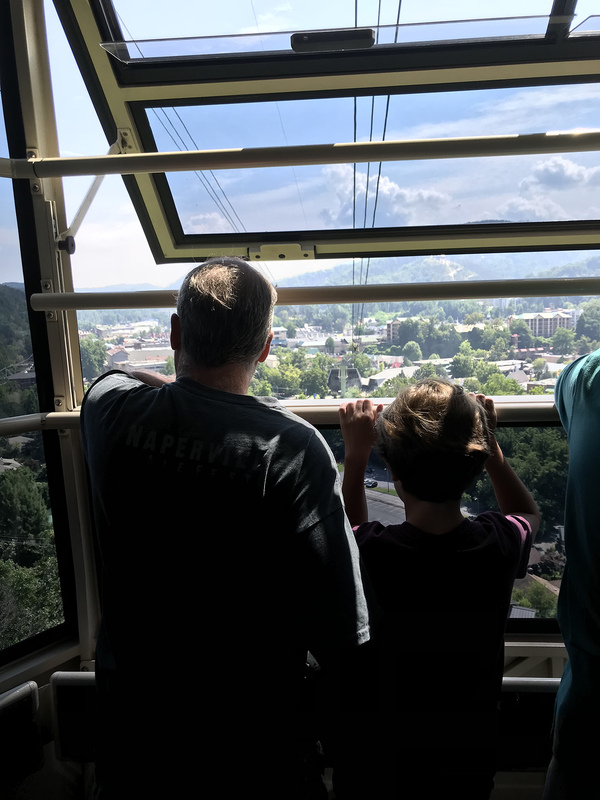 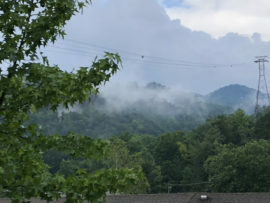 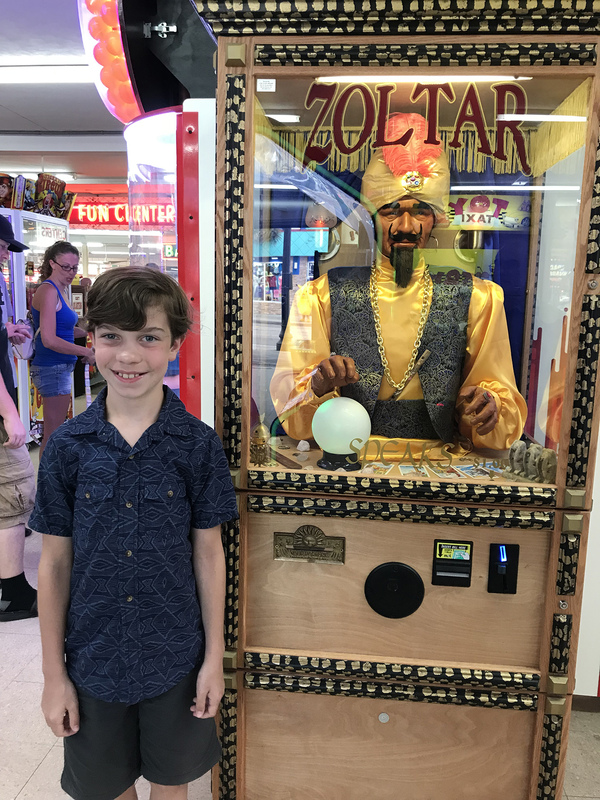 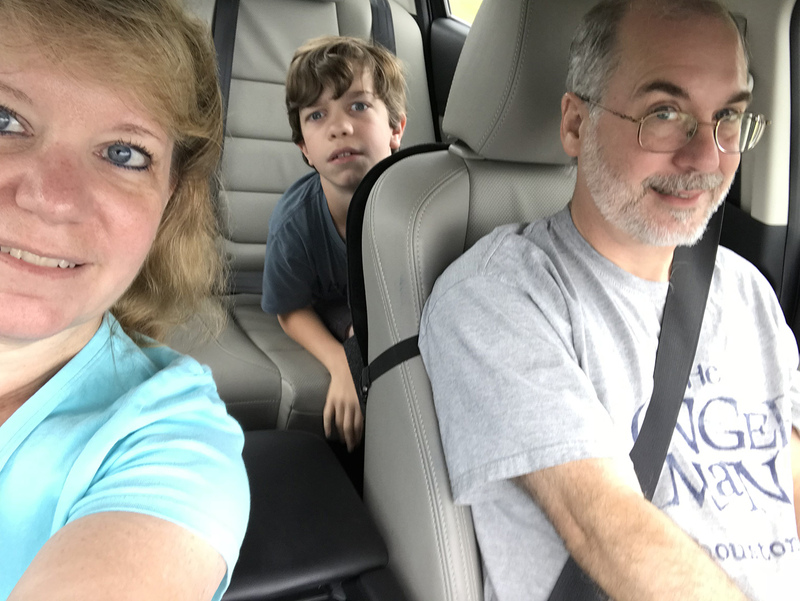 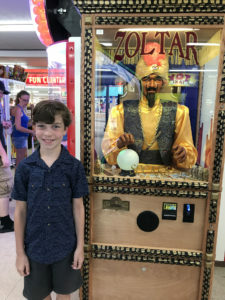 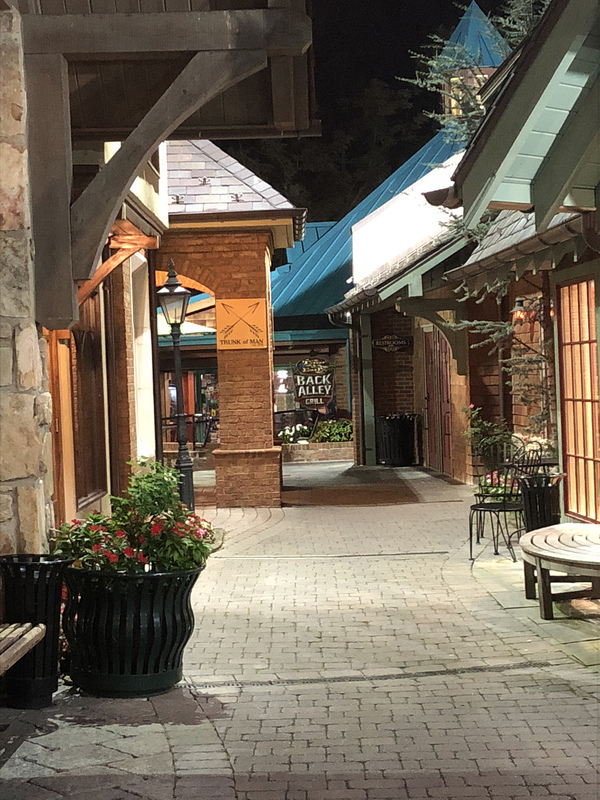 The nine-hour drive to Gatlinburg on Friday turned into more than 11 hours thanks to road construction and rain, so we were pretty tired when we rolled past Dollywood and finally into picturesque Gatlinburg. 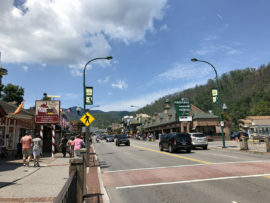 The town was gridlocked with tourists driving down the main drag at 7:30 at night, and it took us almost a half hour to drive down the main street and then circle back to check into our hotel, the Old Creek Lodge (highly recommended – nice woodsy decor rooms with wood floors that overlook a small creek at the base of an aerial tram line!). Luckily, Bennett’s Pit Bar-B-Que was just a block away from our hotel, because the skies opened up just as we left our hotel to scout for dinner… after waiting out the rain a few minutes beneath an awning, we ducked across the street and got a booth at Bennetts, where we had one of the most entertaining waiters I’ve seen in a long while. We also had some solid BBQ. 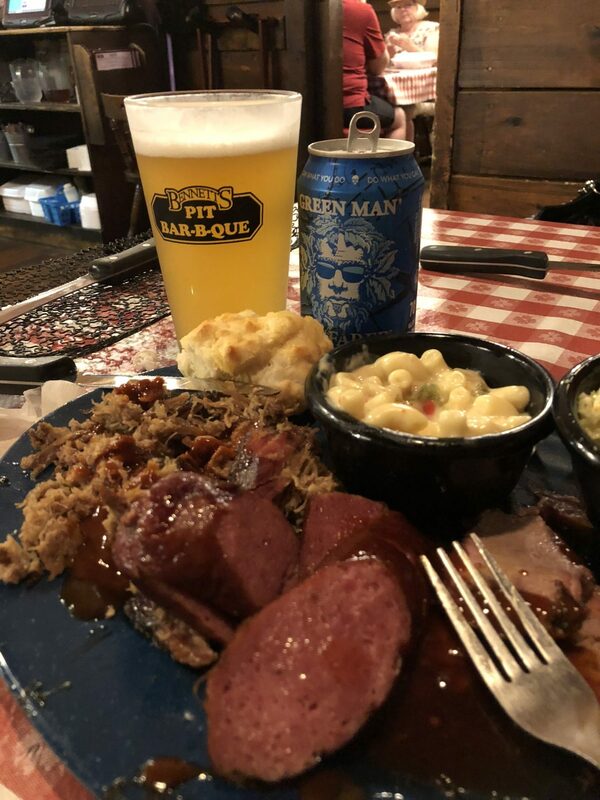 I enjoyed the brisket, smoked sausage and pulled pork, as well as the Mandarina and Green Man IPAs that they had in stock from Asheville, NC. 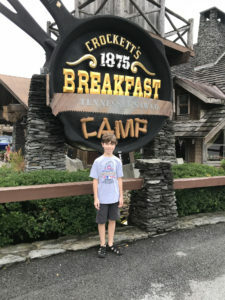 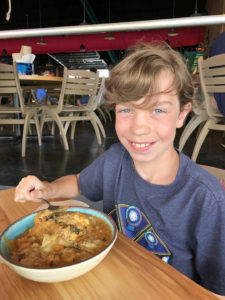 Unfortunately the rain and late arrival meant that we really couldn’t explore the town that night — the next morning, we had a big breakfast at Crockett’s Breakfast Camp (thickest pancakes I’ve ever seen!) 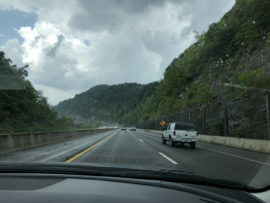 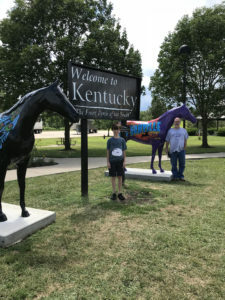 and after a quick walk (cut short by another brief rain shower) we hit the road to the coast, though we decided then that we were going to stop in Gatlinburg on the road home to see more. 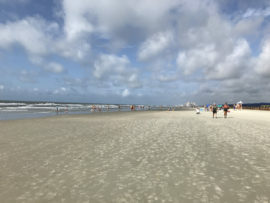 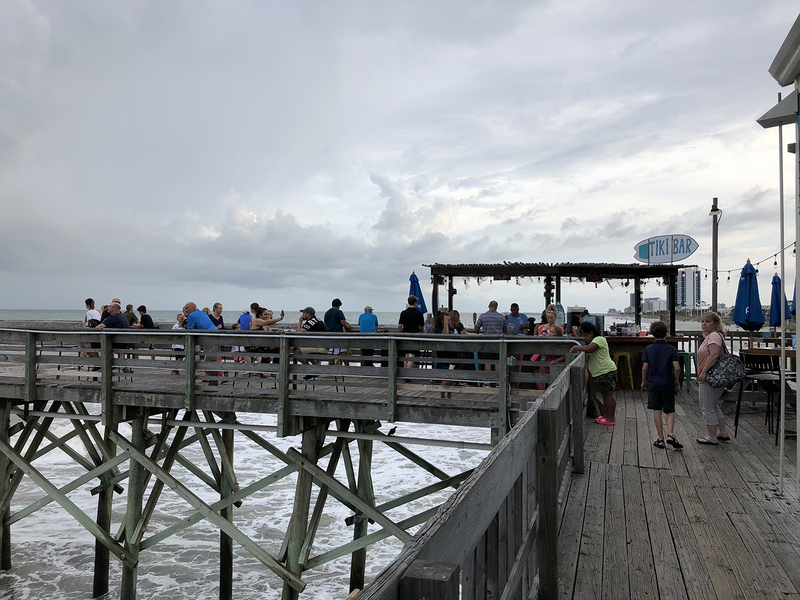 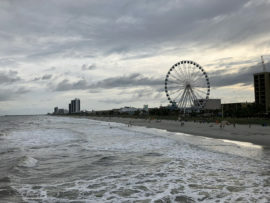 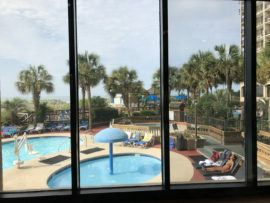 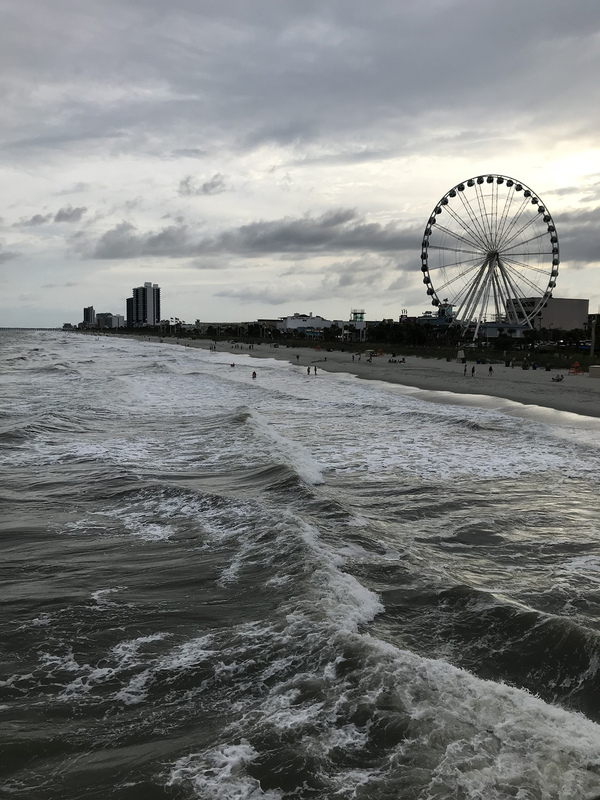 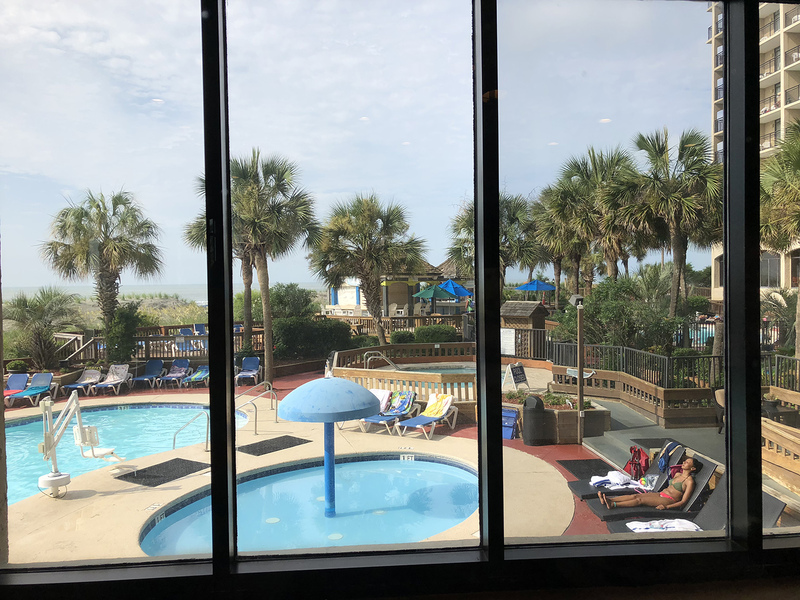 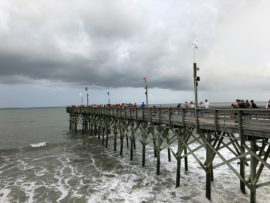 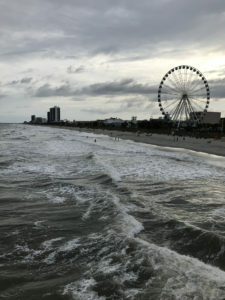 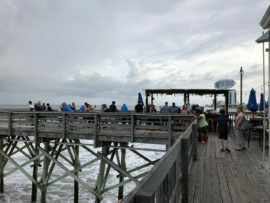 The estimated six-hour drive bloated again, thanks to the slow winding route we took through the Smoky Mountains, highway accidents and lots of rain, so when we finally hit Myrtle Beach after 7 p.m., we went straight to dinner before heading to the hotel. 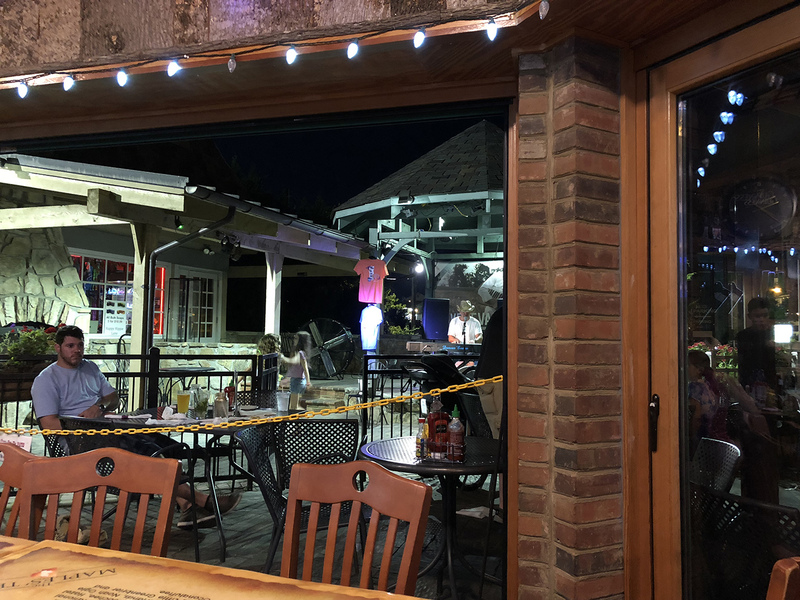 We stopped at Bully’s Pub just down the street from our hotel in Barefoot Landing, and there I discovered the beer that I would drink for the rest of the week — New South Brewing’s Dirty Myrtle DIPA. 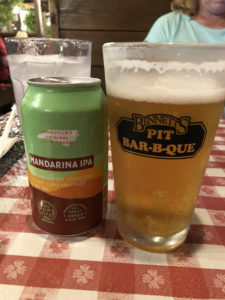 I found it at almost every place we ate and before we left town, I ended up driving to the brewery (which had a cool little tasting room) and buying a bunch in cans to take home. 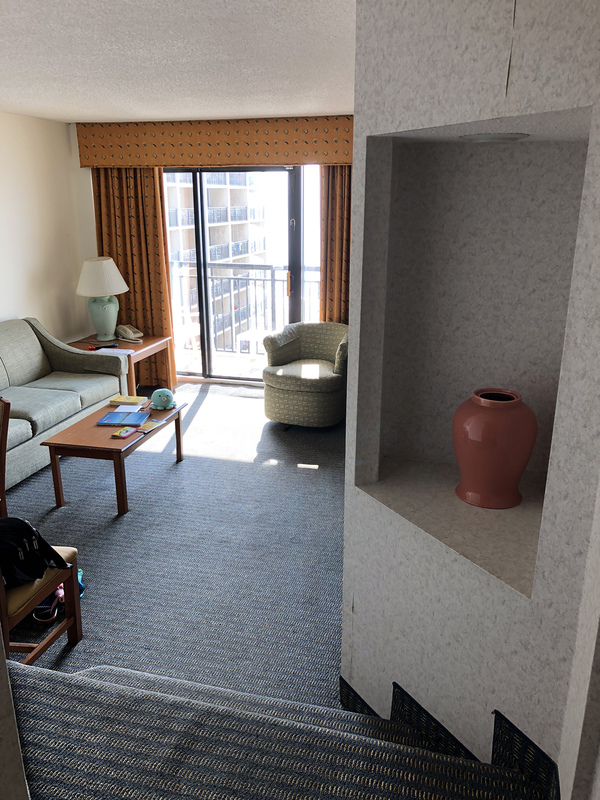 Our condo at Beach Cove was great, with a balcony facing the beach on the 14th floor (which Shaun pointed out was actually the 13th floor.) 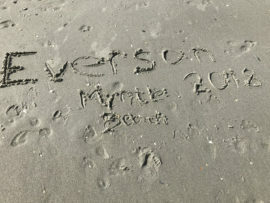 On Monday, Shaun and I went down after breakfast and ended up spending six hours on the beach. 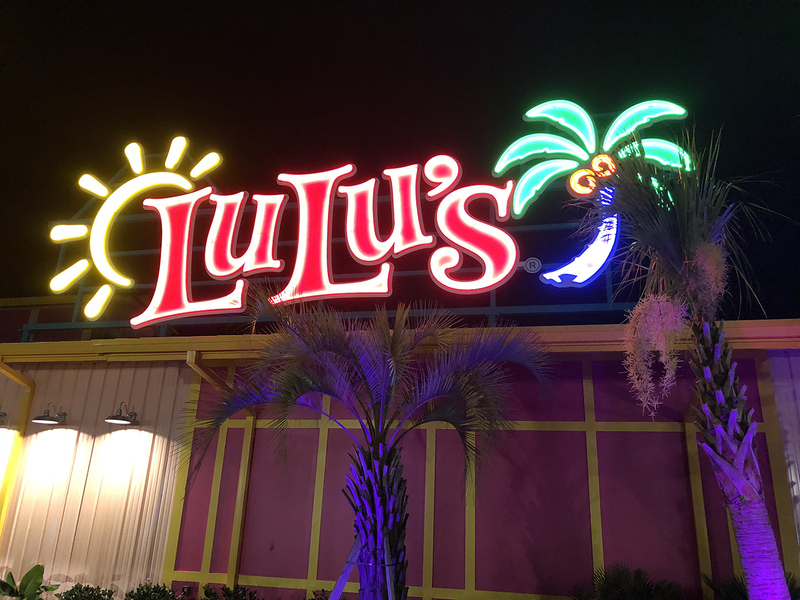 When we finally called it a day, we cleaned up and drove down to the main attraction of Myrtle Beach. 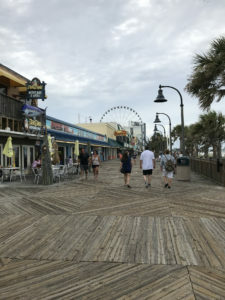 I’ve heard a lot about the Myrtle Beach boardwalk so I was anxious to see it. There’s a ferris wheel there and a bunch of bars and arcades, but it was honestly a bit smaller and seedier than I expected, given the hype I’ve seen for it. 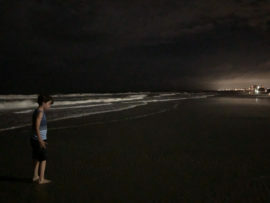 Nevertheless, it was a cool place to stop for a little while. 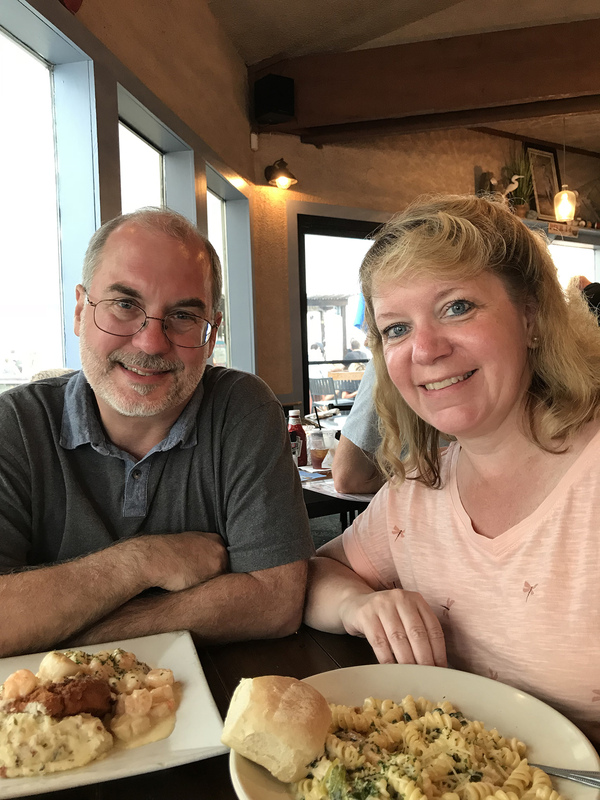 Geri and I were celebrating our 30th wedding anniversary that day, and enjoyed a great dinner at Pier 14, a restaurant perched out on a pier — which was a gorgeous setting. When we got back to Beach Cove, Shaun and I hit the beach — there were lots of people walking around “crabbing” in the dark with flashlights aimed at the edge of the tide line… so we checked it out ourselves. 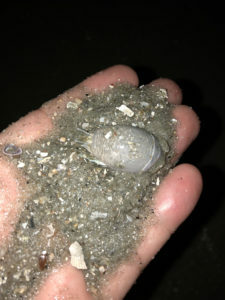 Shaun managed to catch a couple minnows swimming in the inch-deep tidewater, as well as a couple sand crabs. 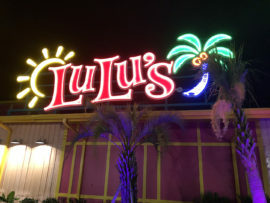 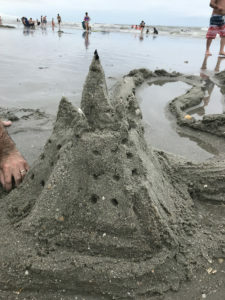 On Tuesday, Shaun and I spent a few more hours on the beach and built a well-barricaded sand castle (that still could not withstand the tide) before heading down to Barefoot Landing again to shop and have dinner at LuLu’s, a cool new seafood-oriented restaurant owned and operated by Jimmy Buffett’s sister. 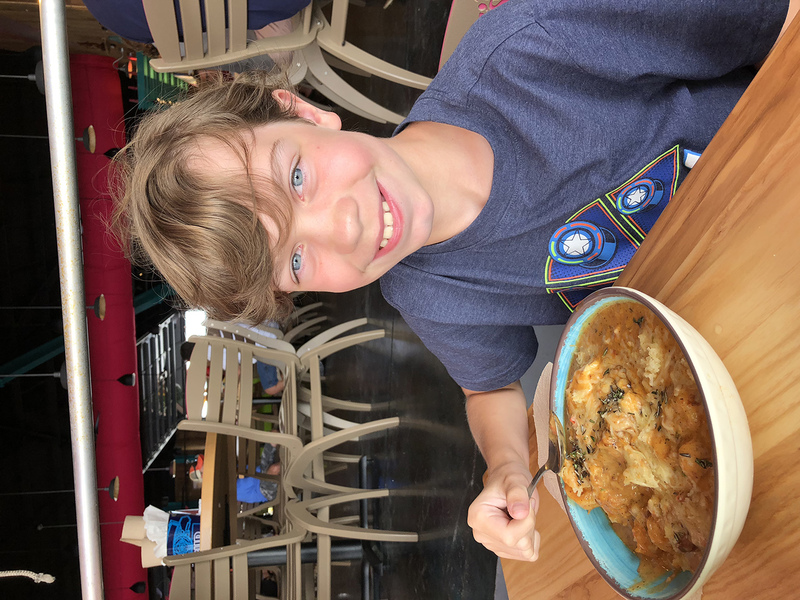 The shrimp and grits were awesome! On Wednesday, we spent some more time on the beach (and built a “fish trap” hoping that we’d catch some of the minnows that washed up with the high waves… alas, we did not). 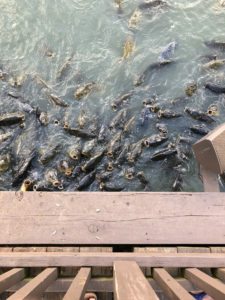 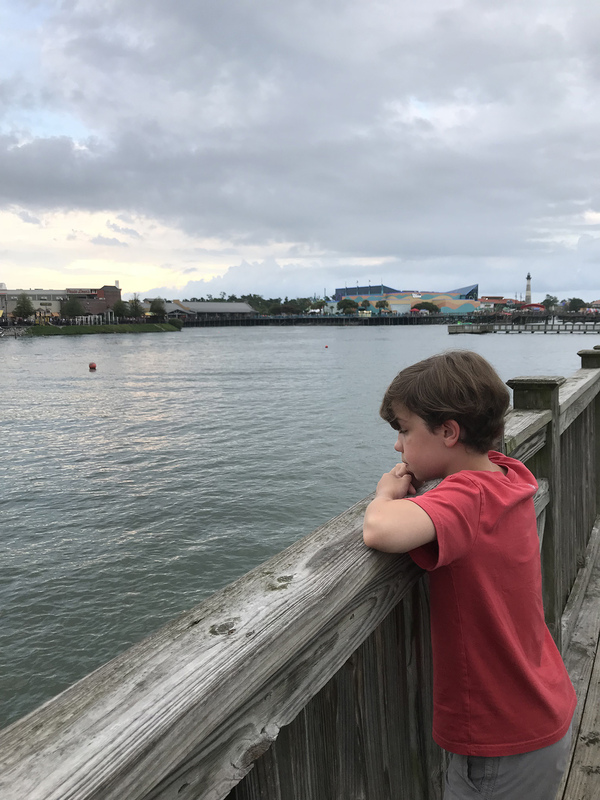 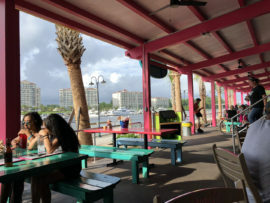 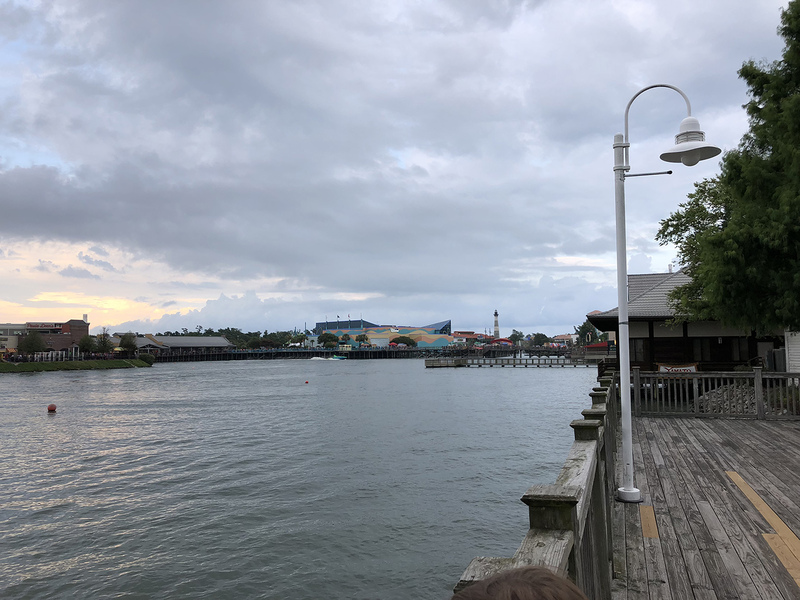 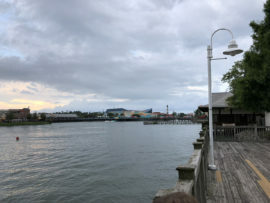 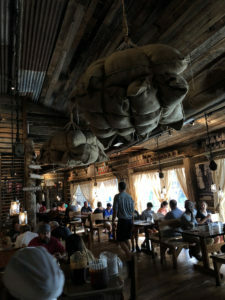 In the afternoon we went back to the Boardwalk and had a snack at the Bowery before going to Ripley’s Believe It Or Not Odditorium. 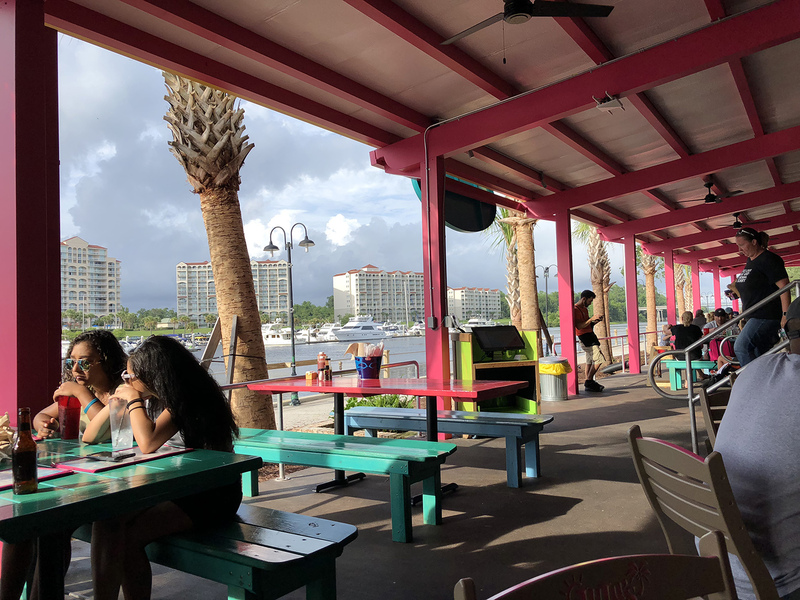 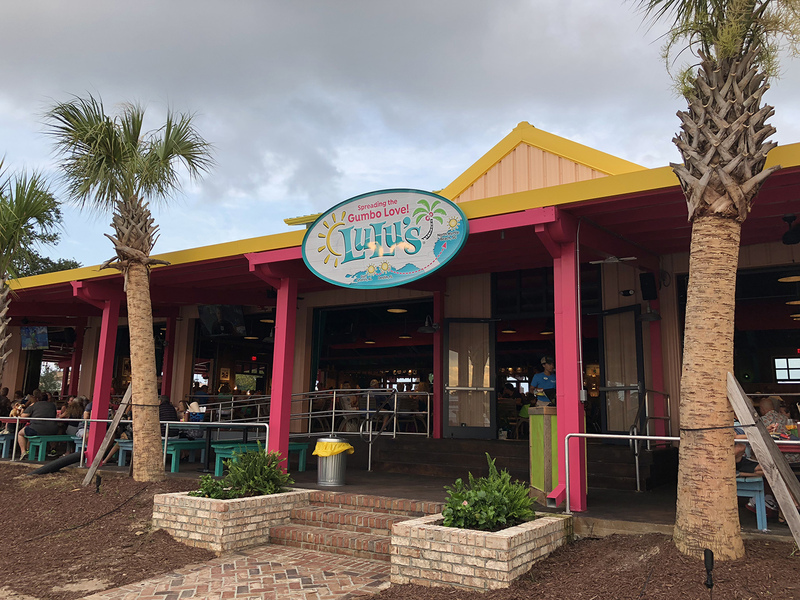 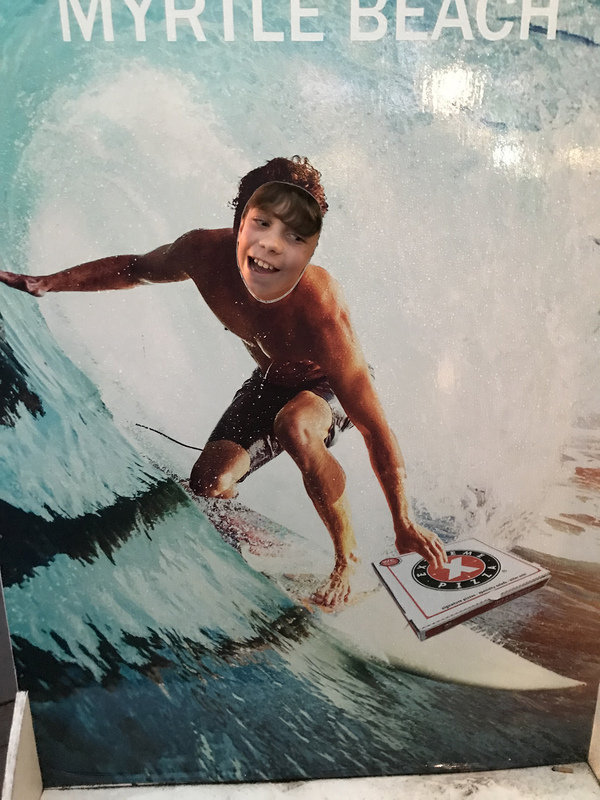 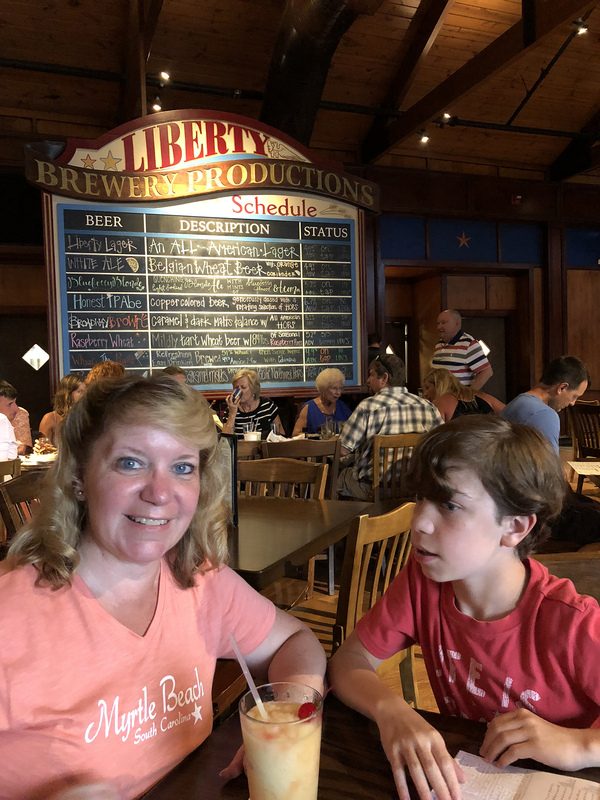 Then we headed over to New South Brewing to pick up my Dirty Myrtle double IPAs before going to Broadway at the Beach, a more modern tourist trap that beats the classic Boardwalk easily for shops and entertainment. We found a couple chatchke’s there and had dinner at Liberty brewing before calling it a night. 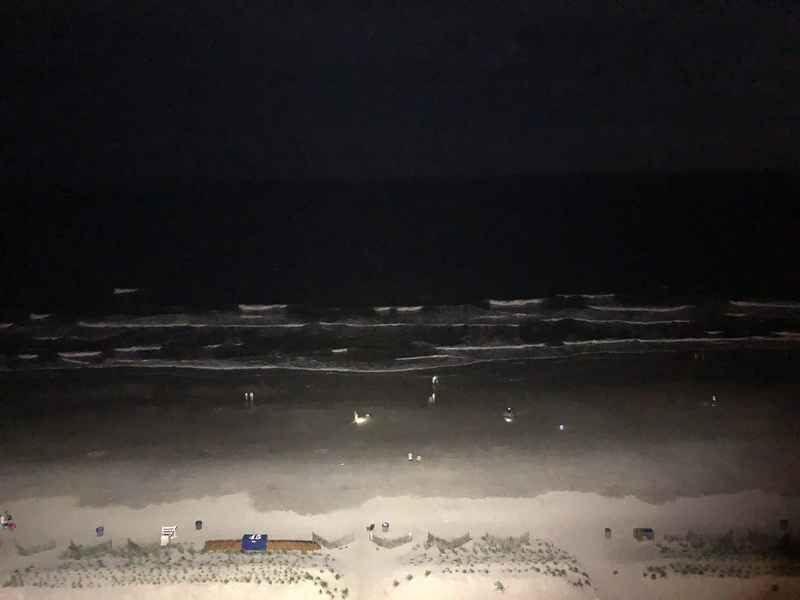 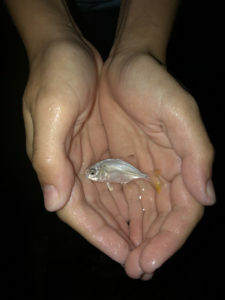 Back at the hotel, Shaun and I hit the beach with our iPhone flashlights to go crabbing once again… sadly, this time around Shaun was not able to catch a fish barehanded as he did a couple nights before. 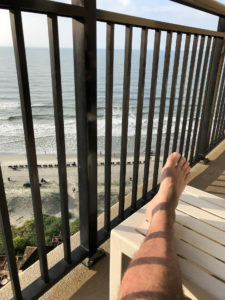 On Thursday morning, I took a quick final dip in the surf before we hit the road to start the long drive home. 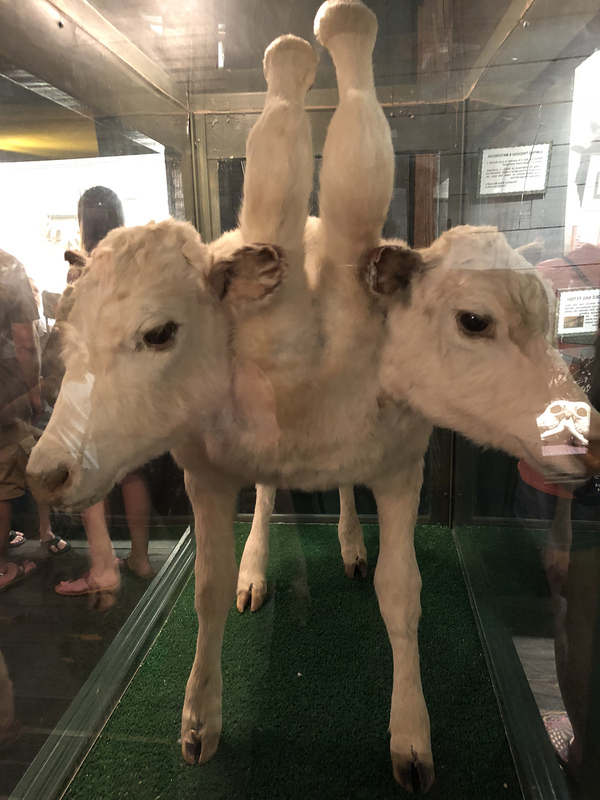 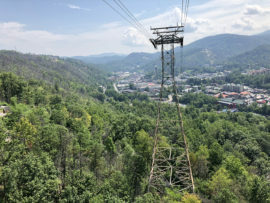 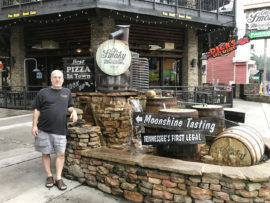 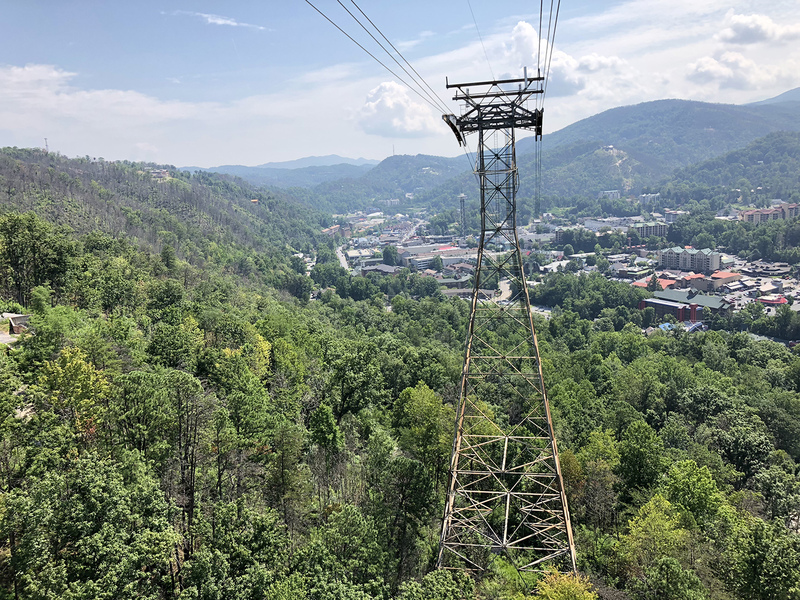 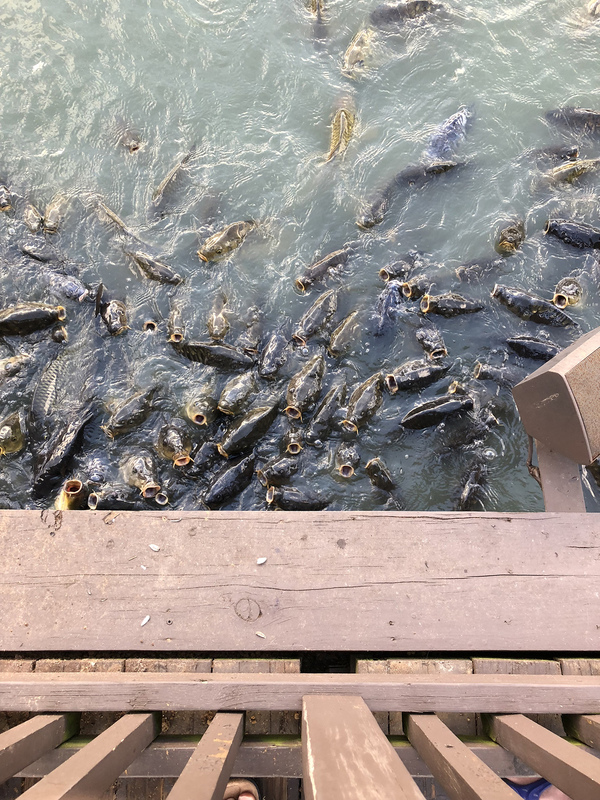 We’d been thinking of taking a side trip to Charleston on our return, but the storms that had been popping up all along the coast that week were in full swing there, so instead we headed straight out to Gatlinburg, after a BBQ lunch at Bar-B-Que House (which had super tender brisket!). 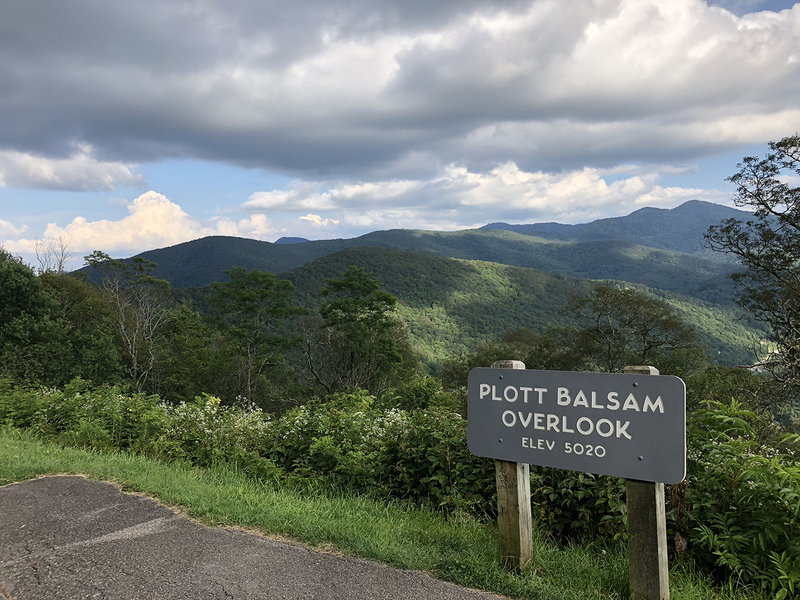 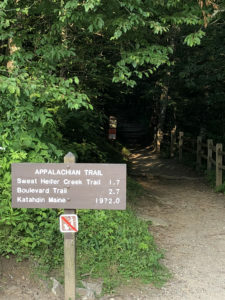 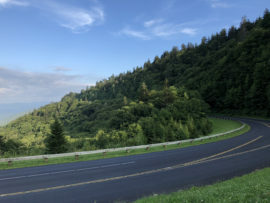 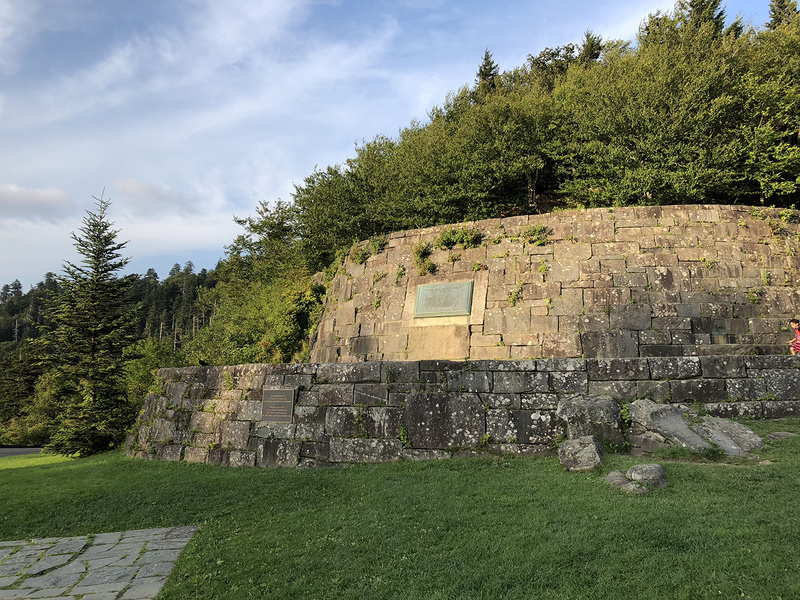 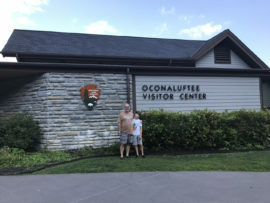 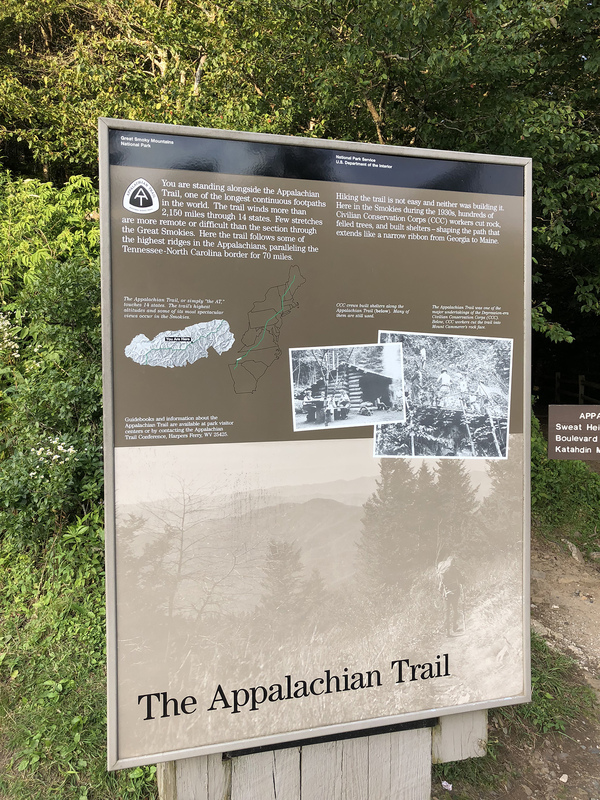 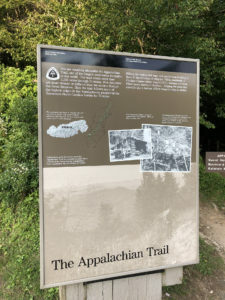 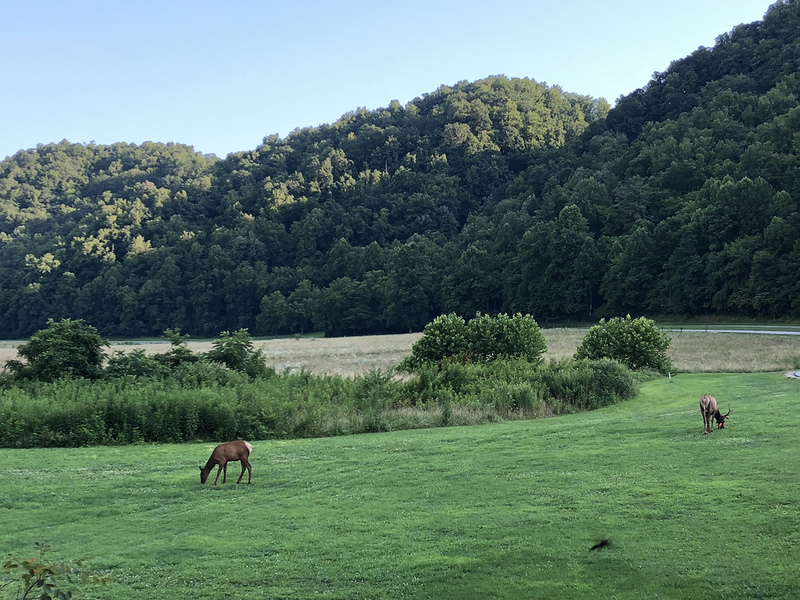 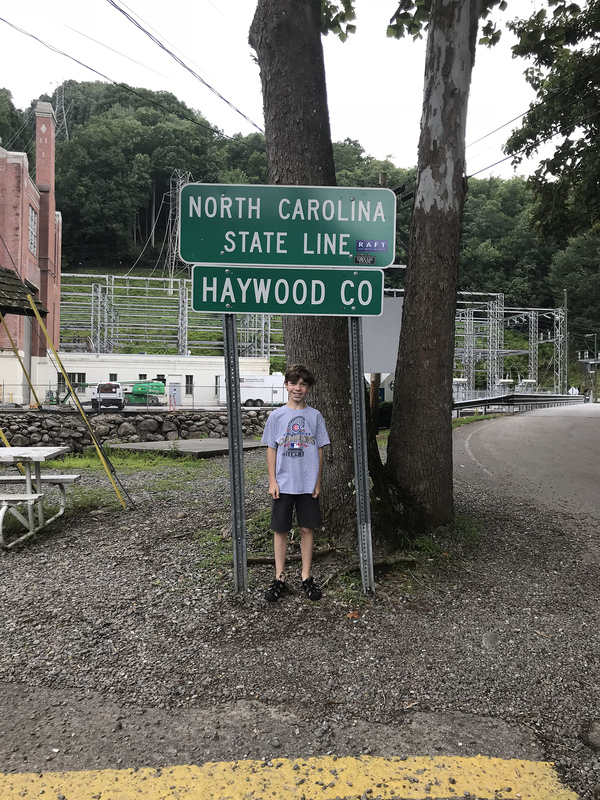 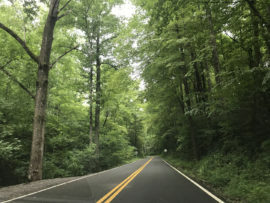 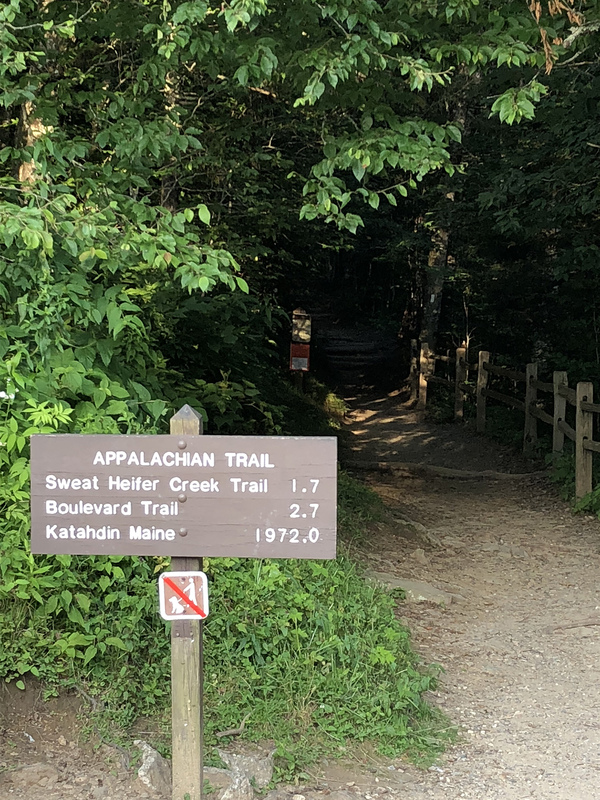 I plotted a route through the center of the Smoky Mountain National Park on Route 441 (a different route than the way we’d used on our way to Myrtle Beach) and it was a great choice. 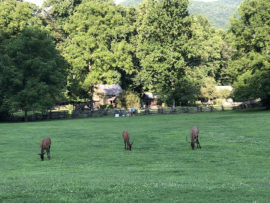 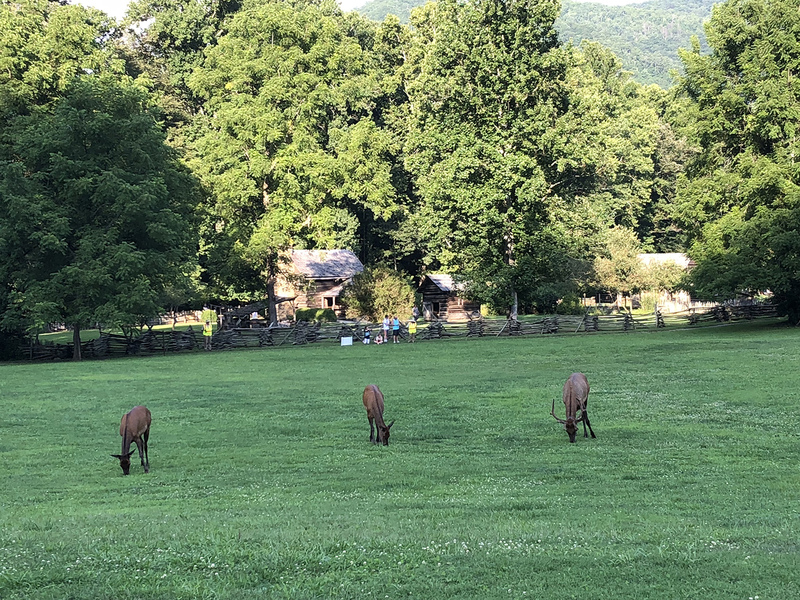 We saw a herd of elk at the Oconaluffee Visitor Center, as well as a bunch of breathtaking views of the Smoky Mountains. 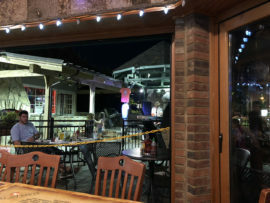 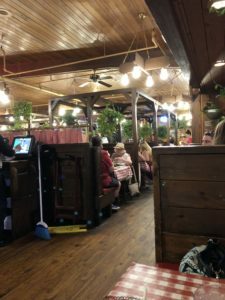 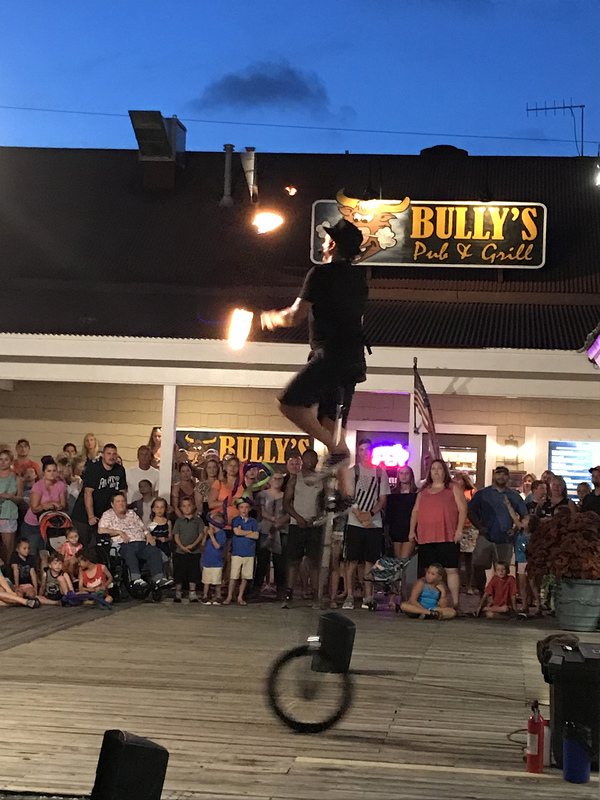 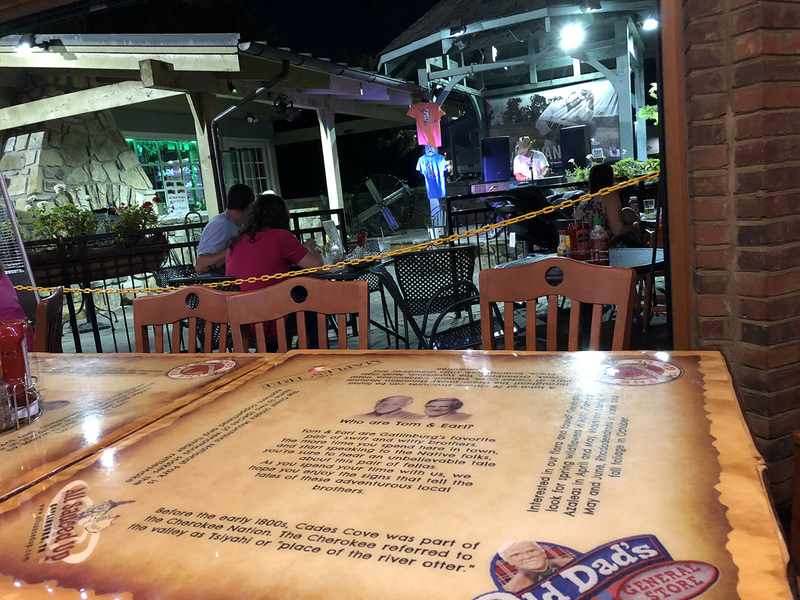 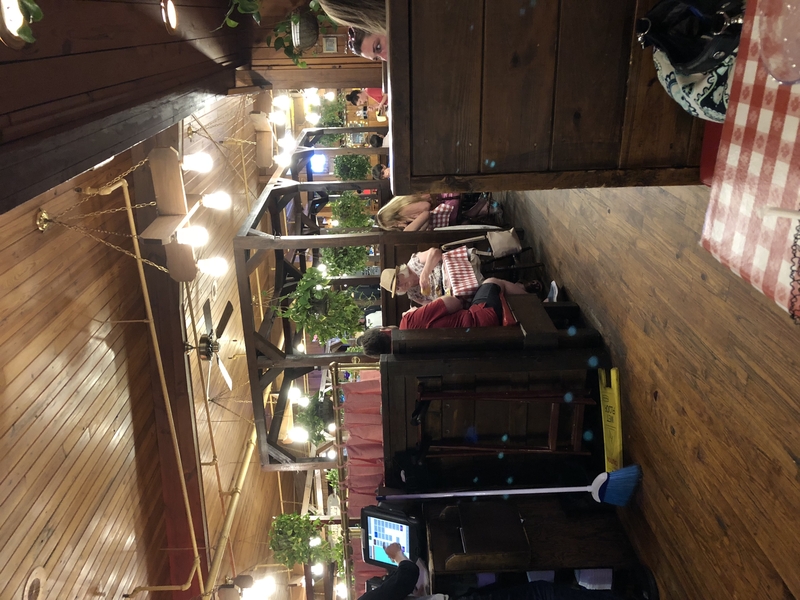 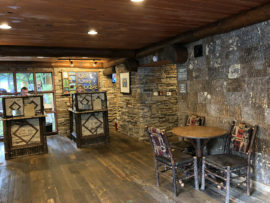 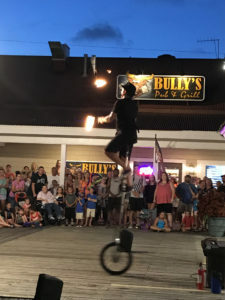 When we hit town, we checked back into the Old Creek Lodge and walked a few blocks to have dinner at the Tom and Earl’s Back Alley Grill where a countrified piano man was performing a mix of pop and country songs on the patio. 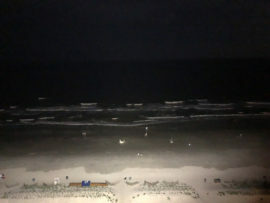 It proved a perfect relaxing ending to the long day. 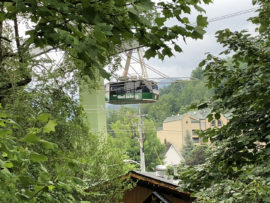 The next morning, we stopped back at Bennett’s for a breakfast buffet, before catching the air-tram up the mountain to take in the view from the ski resort area there. And then…after a quick last walk of the main street, we packed it up and headed down the long road home on Friday afternoon. 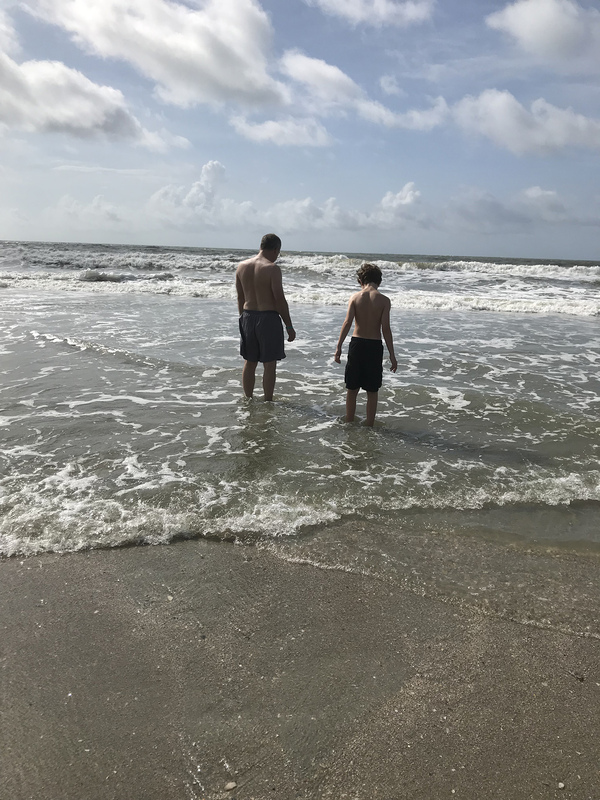 We wanted to stay longer, but I had tickets to the Erasure concert back in Chicago on Saturday night so… we had to call it a day. 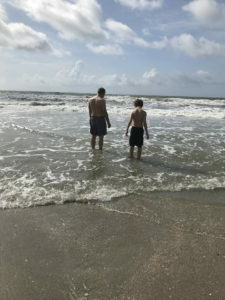 It was a great vacation, and, as they always are, too short. 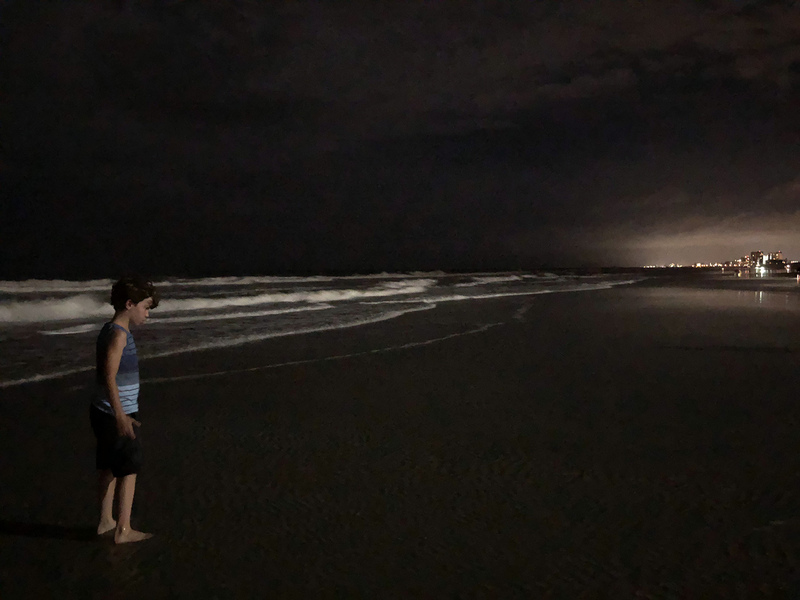 While I spent over 12 hours in the ocean, which I love, at the end of the day it was our “stopover” spot that really caught my attention. 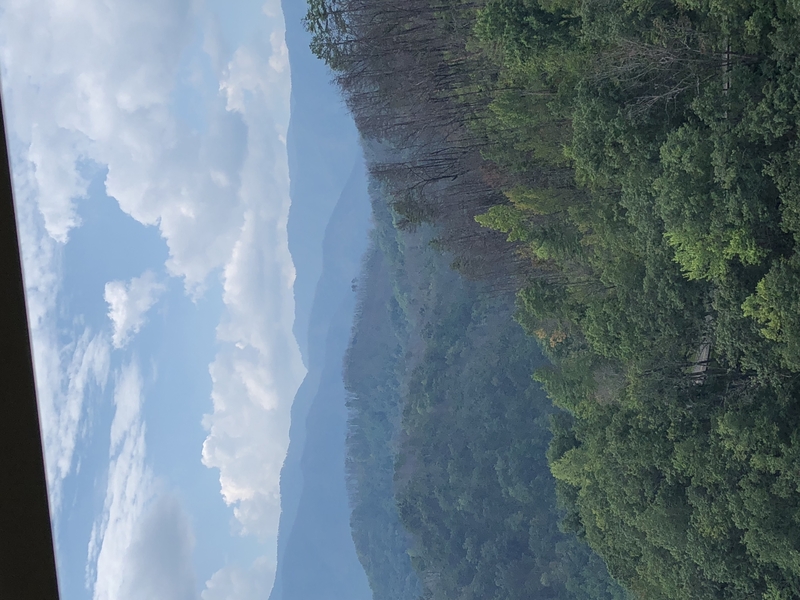 I’d never been to the Smoky Mountains before, and now I’m looking forward to finding an opportunity to return and enjoy the woods and Gatlinburg for a much longer time. 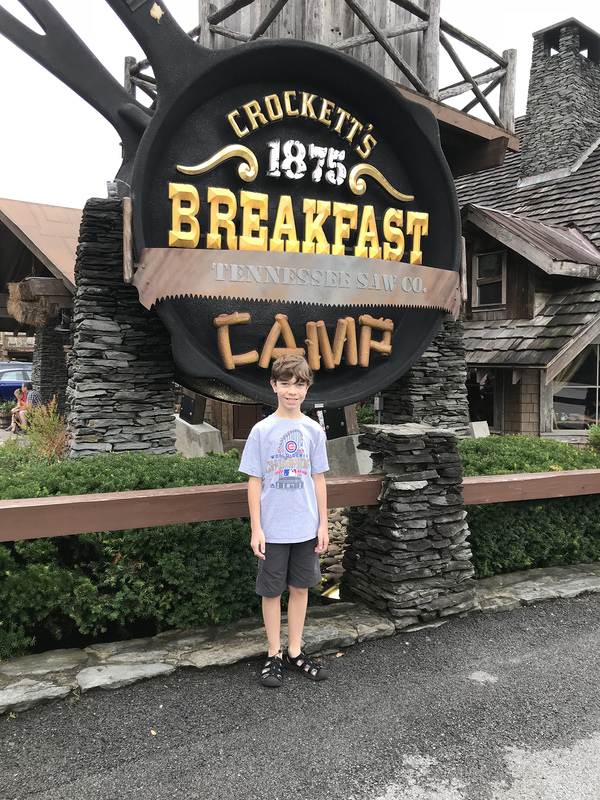 Maybe next time tucked away in a secluded cabin in the woods!